Facing a criminal charge in Washington State? We can help you! 10/10 AVVO rating – both lawyers. Reviews from clients & attorneys. We have helped hundreds of people who are in a similar situation to you fight their charges. We are experienced criminal defense attorneys and fight for people accused of crimes in Washington state. Between us, we have over 30 years of experience in helping people facing criminal charges. This web site is designed to give you information about the crime(s) you are facing, the expected court procedures, and the potential penalties and risks you are facing. However, this is only a beginning. 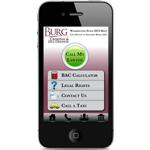 Burg Criminal Defense is experienced in defending almost any criminal charge. As you navigate through this web site, you will notice that we have listed many Washington state criminal offenses. We have helped people with all types of charges. No matter what charges you may be facing, we are happy to meet with you to discuss your case and options. After talking with you, if we feel there is someone who would be better able to help, we can help you connect with the best lawyer for you and your case. We are experienced in helping people accused of everything from shoplifting to murder. We find that we are regularly in court with our clients on cases involving DUI, physical control, domestic violence, assault, theft, reckless driving, minor in possession, drug charges (VUCSA), and everything in between. Washington state DUIs are one of the most common offenses charged here. There are approximately 40,000 people per year accused of Washington state DUI or DWI. Consequently, we have a lot of experience with DUIs in Washington state - having helped hundreds of people with these cases. We have earned an excellent reputation in this field. DUIs are one of the hardest cases to defend, many attorneys have told us that they are harder than even murder cases. The law is difficult, the science is complicated and there is a lot of public sentiment against people accused of DUIs. As attorneys, we have worked very hard to become highly skilled at representing people accused of Washington DUIs. We will not try to "hard sell" you. Geoffrey Burg, present for the signing of HB 1589. Finally, we will not try to “hard sell” you to hire us. We know choosing an attorney is a big decision and one you must make carefully – not under pressure. Because an effective attorney-client relationship requires a lot of communication and trust, we really only want to represent people who feel comfortable with us and have complete confidence in our abilities. If you don't, then you have the right to an attorney that you do feel would be a better fit. Thank you for taking the time to look through this web site. Please contact us if you would like to meet and further discuss how we may assist you. * I have had great success in helping people accused of crimes. * My rate of having people found not guilty at trial is higher than the state average. * In addition, I pride myself (and gauge how well I am doing) by the number of thank you notes I receive from my clients. * I feel proud in saying that I regularly receive these. I have repeatedly been recognized as a "Super Lawyer" by my peers in Washington Law and Politics Magazine. * I am actively involved as a legislative liaison for the Washington Association of Criminal Defense Lawyers. In this role I have written, lobbied for and passed three laws that help people accused of crimes in Washington State. In 2001 I graduated from Gerry Spence's Trial Lawyers College - an intensive training program where we learned trial skills from some of the best litigators in the country. * “Rising Star” recipient recognized by peers in Washington Law & Politics Magazine. * "Superb Lawyer" and 10 out of 10 rating on Avvo. * Awarded "Champion of Justice Award" by the Washington Association of Criminal Defense Lawyers. * Quoted in CBS News published article regarding work on Draeger Alcotest 9510 breath test machine. * I am regularly asked to train other lawyers. * I have worked hard to develop a reputation as a zealous advocate for my clients. I maintain professional and civil working relationships with prosecutors which helps me immensely in negotiations. However, prosecutors know my reputation as a creative and aggressive litigator when my client does not get an acceptable offer. * I am the current legislative liaison for the Washington Association of Criminal Defense Lawyers. For the past four legislative sessions, I have represented the rights of those accused of impaired driving during the legislative process. The laws regarding impaired driving are constantly changing so I am on the cutting edges since I am typically present when the law originates. * I am on the board for the Citizens of Judicial Excellence, a political action committee, which supports candidates which are fair, smart, and respectful to our clients, and oppose those who do not have these qualities. While we try and speak to you in person when you call, if we are in court, Ana is the one who will make sure your questions are answered.As our paralegal, Ana helps us stay organized and on time. She is the person who greets you on the phone and helps with many of the details of your case. Ana has a masters from Central Washington University in Criminal Justice.